Preheat the oven to 160°C/gas 2½. Draw a 22cm-diameter circle on a sheet of greaseproof paper. Place on a baking sheet. Whisk the egg whites and salt until they form stiff peaks. Add a quarter of the sugar, and whisk until the mix is glossy and stiff. Add half the remaining sugar, whisk until glossy and repeat with the remaining sugar. Gently whisk in the cornflour and vinegar. Don't over-beat. Spoon the mix onto the paper circle, shaping into a flat disc. Place on a low shelf in the oven and immediately reduce the temperature to 140°C/gas 1. Bake for about 1 hour or until the meringue is crisp outside but feels soft yet set inside. Cool then peel off the greaseproof paper. Halve the passion fruit and grenadilla and scoop out the seeds. Discard the skins and mix the seeds with the other fruit. Whisk the cream with the orange zest and kirsch until it forms soft peaks. 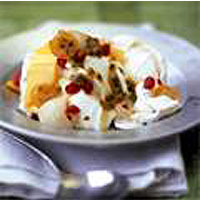 Spoon onto the pavlova and top with the fruit.